Research and demonstration projects are fueling interest in prefabricated engineered wood systems. Editor's Note: The following is a guest contribution from Pete Kobelt, who has been involved in the advent of CLT in the U.S. and Europe for 10 years and built the first CLT factory in the U.S. He is currently consulting on CLT manufacturing, sales, design, engineering and construction and is the Sales & Marketing Manager and Lead on Innovation & Sustainability for McKenzie Construction, a design-build general contractor and millwork company in Miami, FL. Pete Can be reached through buildmckenzie.com or email at [email protected]. Everything old is new again for today’s architects, engineers and developers. Since the earliest civilizations, forward-thinking architects and engineers have always faced two fundamental challenges: How to use existing materials in new, innovative and sustainable ways and how to use new materials in the same innovative and conscientious manner. With origins 20 years ago in Switzerland, Germany and Austria, a mass timber construction (MTC) system known as cross-laminated timber (CLT) has grown into a thriving and growing $2 billion industry, producing 500,000 cubic meters of CLT annually throughout Europe. This success and sustained double-digit growth has prompted additional manufacturing in Italy, Sweden, Latvia, Japan and more recently Canada. The U.S., after years of watching from the sidelines, is finally catching on with successful CLT projects imported from Europe throughout the U.S. and Caribbean, and new manufacturing is ramping up in Montana and Oregon. CLT pioneer DR Johnson in Riddle, OR, recently became the first and only APA Certified CLT manufacturer in the U.S. President Valerie Johnson said, "Our phone lines and emails are swamped with interest from around the region. It seems as though there is significant pent up demand for CLT in Pacific Northwest." University-driven research from Washington State University and Oregon State University in the West to University of Maine, Virginia Tech, Clemson and University of Arkansas in the East is fueling substantial interest in campus-based construction projects as well as manufacturing. University of Arkansas Dean and Architecture Professor Peter MacKeith, along with the governor of Arkansas, Asa Hutchinson, and many statewide stakeholders are hosting a CLT/MTC Manufacturing & Economic Development Summit on the university campus in Little Rock on Aug. 19. "The summit has been organized in response to tremendous statewide interest in leveraging our vast renewable timber resources and creating unprecedented value-added manufacturing and high paying jobs. The summit will be an opportunity to also educate the architectural, engineering, construction and development industries about the many value propositions and attributes of cross-laminated timber and mass timber construction," MacKeith said. Arkansas has an abundant and underutilized resource in nearly 19 million acres of trees, including the rapidly renewable Southern Yellow Pine species, an ideal CLT manufacturing candidate. Advances in super strong formaldehyde-free adhesives coupled with the simple but powerful 90-degree cross-lamination layup and pressing delivers a strong prefabricated biaxial slab that can be used not only to replace concrete floors, but also as a complete system for the shell and interior of any building. "These are remarkable advances in both engineered wood and prefabrication that enable us to erect high performance, low impact buildings with unprecedented speed and precision," said Seattle-based Arup structural engineer Hans-Erik Blomgren. Blomgren is a lead engineer at Arup on two 10-to 12-story "Timber Towers" in New York City and Portland, OR, currently in design. These projects are the result of the U.S.D.A recently sponsoring a competition in support of mass timber construction. MTC techniques use engineered wood systems like CLT and Glulam beams together to create structural integrity. "We have learned that we can push MTC systems to deliver on both economy and performance for structural, fire and acoustic requirements. 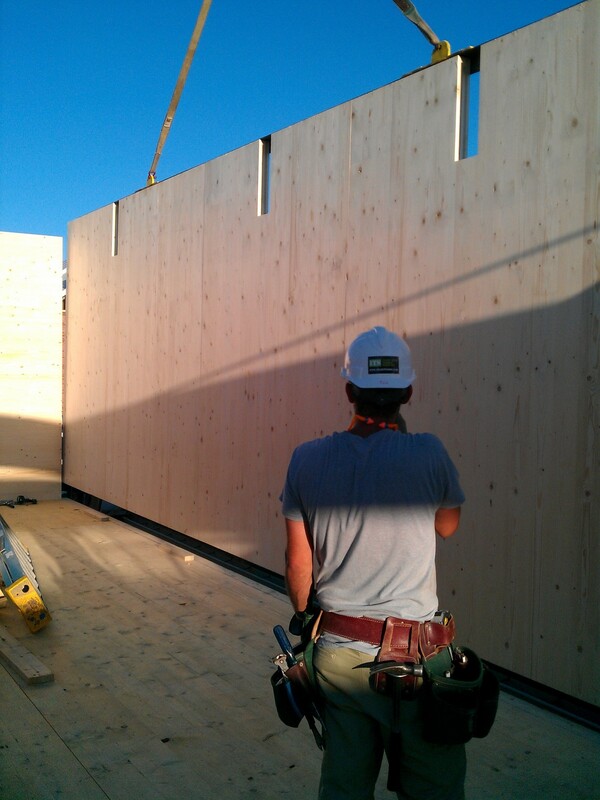 CLT panels are a certified engineered wood product that allow us to design with confidence. The new fastening technologies available for CLT are an essential part of the system," Blomgren said. "MTC systems fundamentally change the way we can build with wood in nonresidential applications. Fast, clean and green. This is the future." Today, with the emergence of global, carbon-conscious markets, carbon neutral engineered wood products offer legitimate, proven and profound alternatives to carbon intensive, high embodied energy building materials like concrete and steel. Embodied energy is the energy used to manufacture a product and ship it to a site. Concrete and steel manufacturing alone accounts for approximately 10% of global carbon emissions. Wood growth and use removes and sequesters carbon from the atmosphere. In fact, one cubic meter of CLT holds one ton of carbon over the course of a full life cycle. "It is critical that we consider all aspects of the materials that go into our buildings. It’s one thing to make a high-performance, low-energy building with concrete, steel, aluminum, and glass — where the majority of a building’s embodied carbon comes from. But it is an entirely different story when we have the ability to use a naturally low impact, low embodied energy material like wood and CLT in terms of positive environmental and economic impact," said Skanska USA Director of Sustainability Stacy Smedley. Architect Thomas Robinson, principal at Lever Architecture in Portland, OR, is designing the 12-story Framework CLT building, which is projected to be the tallest timber building in the nation and is one of the winners of the U.S.D.A design competition. "We are thrilled to have been chosen for the pioneering project. Our team is profoundly passionate about the possibilities that lie ahead with CLT and mass timber construction," Robinson said. So why is the U.S.D.A sponsoring design competitions in the construction market? It’s a fair question. For years, the U.S. Forest Service, under pressure from many stakeholders, has struggled to effectively manage National Forests. "We have shifted from harvesting 80% of our timber on National Forest to just 20% in many regions. This leaves our vast renewable timber resources essentially unmanaged, congested, infested and prone to extreme, unprecedented and worsening fire conditions," said Russ Vaagan, owner and managing partner of Vaagen Bros in Colville, WA. The USDA is the parent of the Forest Service, so when the leaders of the USFS reported to the USDA, essentially saying, "Houston we have a problem…" the USDA, including Secretary of Agriculture Tom Vilsack, hosted a conference in DC to listen to various stakeholders and experts on how to add value to National Forest resources by using products and systems like MTC and CLT. Clearly the presentations and discussions resonated deeply with the USDA, and the design competition was born. What lies ahead for CLT and MTC in the U.S. is uncertain, but what is clear is the significant interest, discussions and general buzz about a revolutionary construction system. If CLT continues to prove that it dramatically accelerates build times, addresses the growing construction labor shortage with prefabrication and reduces carbon footprint, then it appears that mass timber construction using CLT is here to stay.